When it was first announced, there was a strong sense that the adaptation of J.R.R. Tolkien’s classic children’s novel into three films rather than two was for the sake of increased ticket sales. However the decision was made though, the decision has long since been made, and third and final chapter of The Hobbit, The Battle of the Five Armies has now been released. Depends on your definition of “defining”. And regardless of why it came about, it is not a bad film. It’s well made, the battle itself is often spectacular, and it highlights just how far CGI has come since Gollum ushered in a new era. That said, as the third part of the trilogy, it did seem a bit out-of-place. The main problem being that it just doesn’t feel like the third part in a trilogy. With the dwarves completing their quest and taking back the Lonely Mountain, The Desolation of Smaug seemed to end mostly on a substantial ending. In addition to this, Gandalf’s cliffhanger and the added on Sauron subplot are resolved far too quickly at the beginning of Five Armies, that they may as well have just been wrapped up by the end of Smaug instead. In fact this cliffhanger seems to only serve the purpose of bringing people back to watch the third film. As much as the main events of Five Armies are a part of the original novel, the way they have been presented in the film makes it feel as though it is an entirely new entity, and one which has been hijacked to bridge the gap between The Hobbit and The Lord of the Rings. There certainly is logic to this, and it does justify the executive decision to produce three films from the single novel source material (even over the increased ticket sales argument), but the trouble is that there just isn’t enough to fill a complete film. Especially one that tries to fit in with, and will inevitably be compared to, its epic predecessors. Because of this, many of the links between Hobbit and Rings just seem arbitrary. Unlike Dath Vader joining Grand Moff Tarkin’s side at the end of Revenge of the Sith, Thranduil’s parting words to Legolas don’t so much tie the last entry in one trilogy to the first in the next, as potentially change the entire character relationship between the two: is Legolas now Aragorn’s stalker and/or guardian angel rather than brother in arms? A younger immortal elf. Ten years later. That said, some of the links were nicely crafted. 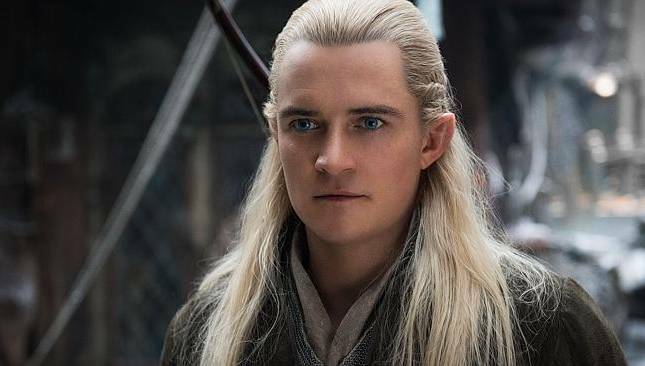 It’s fair to say the addition of Legolas is the biggest manufactured link of all, and generally he is well used in both of the Hobbit films in which he appears. His presence has been made to gel nicely with the other elves and their interaction with the dwarves, and his jealousy towards Tauriel and Kili even adds an extra layer to his relationship with Gimli in the later films. But more than just these connections, the film includes the expansion and addition of new characters, such as Alfrid. Where a single counselor to the Master of Lake-Town was referred to in the book, this subplot was not only taken too far but also given an unsatisfactory conclusion. Again it is easy to see the reason for this being included, at times Five Armies can be both dark and emotional, and comic relief is often needed to alleviate some of the tension; as highly respected storyteller Joss Whedon explains, “make it dark, make it grim, make it tough, but then, for the love of God, tell a joke.” This was done well in Rings with the aforementioned rivalry between Legolas and Gimli, but for all his tales of epic heroes and bravery, is the most cowardly person escaping with all the gold he could carry a message Tolkien ever wanted to get across? And the reason these just feel like padding is that in a similar fashion to war films such as Black Hawk Down, the single battle is pretty much the only narrative of the whole film; something which in this context just doesn’t seem to work. The film may have shown the burning of Lake-Town, but a climactic battle such as the one shown here is an event which needs to be lead up to properly. Despite it being the culmination of two previous films, this anticipation is something that gets lost in the 12 month wait between theatrical releases. I’m aware this may be painting the film in a negative light, but when watching it I couldn’t help but notice that these things took me out of Middle Earth and back to the cinema I was watching it in. And once this started happening, it didn’t stop. One of the biggest problems overall was one of those small things which, for me, also caught my attention within the first two films. Whilst I admit it comes from a limited perspective in terms of worldwide distribution, the amount of British television actors used in the cast can at times be distracting. Not that I am begrudging them their talents and achievements, it’s just that it seems as though they have been specifically chosen to stand out in their roles, and therefore somewhat annoyingly, stand out. Ok, so it is an unusual hat. Take the dwarves for example: in An Unexpected Journey we are introduced to them as they come knocking on Bilbo’s door in ever-increasing amounts. There’s a dwarf, another dwarf, and then another. 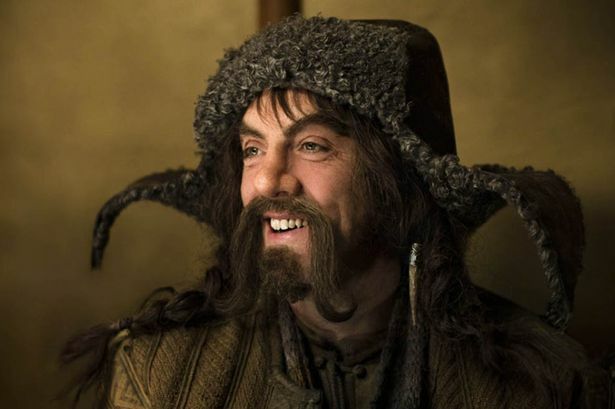 Complete with bushy beards, big hair, large frames, and personalities to match, next comes two dwarves, three dwarves, and then there’s James Nesbitt in a hat. It’s almost as if he arrived in the Shire on one of his Thomas Cook package holidays. Yes, The Lord of the Rings had its share with the likes of Sean Bean and Bernard Hill, but at no point do we expect Boromir to tell the council of Elrond to “be more dog” when dealing with ring of power. Billy Connelly’s voice alone on the other hand, whilst perfect for Pixar’s Brave, coming from the mouth of a rough and ready dwarf is too close to his own flamboyant Glaswegian stand up persona to be taken seriously. 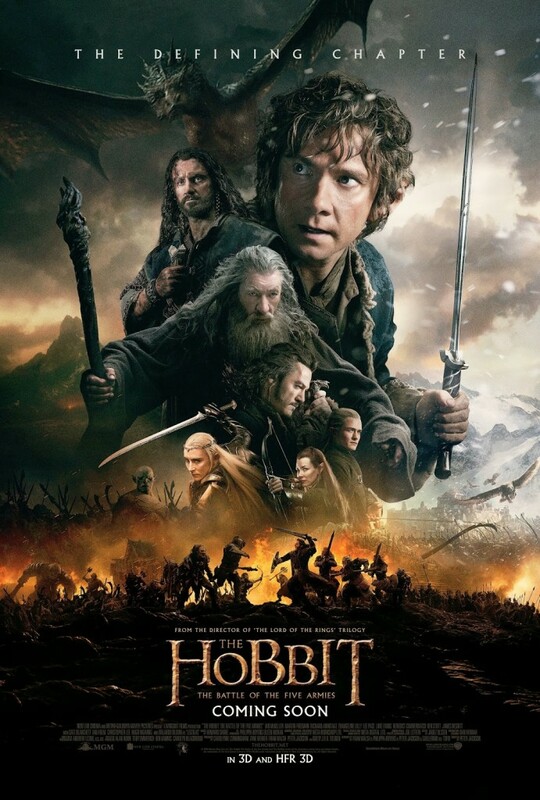 The Battle of the Five Armies is in a many ways a fine example of film making, but for all of its accomplishments it falls at the first hurdle. What use are great acting, meticulous production design, and state of the art special effects if the story they are serving isn’t up to scratch. J.R.R. Tolkien didn’t just write novels, he crafted an entire world and populated it with different races, histories, mythologies, and even complete languages. I can’t say how much of it was by design and how much was interference from New Line Cinema and Warner Bros., but in their attempts to do Tolkien’s novel and his world justice, Peter Jackson and co. just didn’t have enough focus on crafting the story. And isn’t that the whole point of a film in the first place?